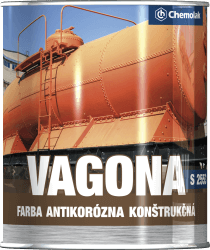 is used as a primer as well as a top coat (2 in 1) for the coating of steel objects, wagons, steel constructions in interiors, exteriors and where it is necessary to ensure adequate functionality, anticorrosive protection and weather resistance. It is suitable also for a medium aggressive environment. It is manufactured in RAL and STN colours according to the customer´s requirements.